The Quality, Laboratory and Water safety Department through the Quality Assurance Unit, implements the quality system according to the requirements of ISO/IEC17025, implementing the quality system manual of the department, auditing the work procedures in accordance with this manual and continuous improving the quality system. 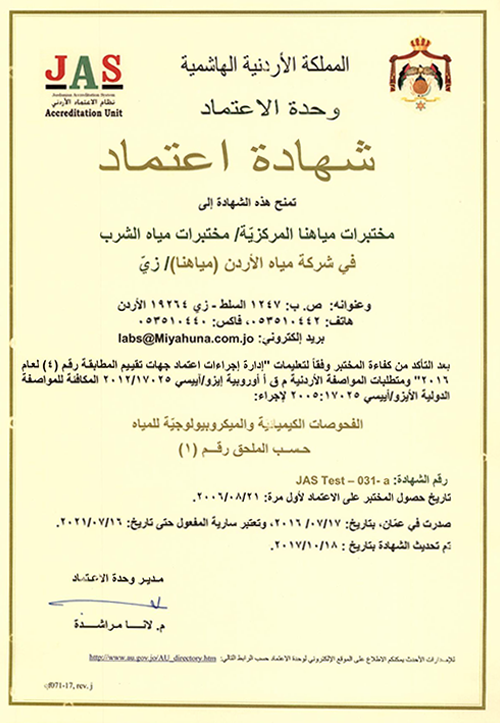 The department obtained international accreditation from the United Kingdom Accreditation Service (UKAS) since 2010, renewed in 2014 and stopped in 31/05/2018 after the Jordanian Accreditation Unit gained international recognition from ILAC. 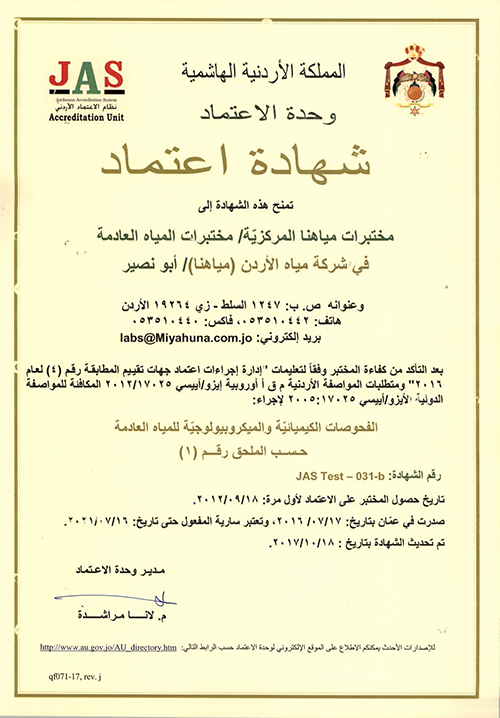 The department has also been accredited by the Accreditation Unit - Jordanian Accreditation and Standardization System since 2006, renewed in 2011 and 2016.This accreditation addresses the requirements of ISO/IEC17025 for analysis water and wastewater, that has been obtained by specialized personnel and using the latest technologies in accordance with internationally recognized testing methods to produce reliable and high-accurate results for decision-making on water quality and compliance with international and national standards.